Clean air, land, and water are integral to the health, economic success, and prosperity of Connecticut. • Expand and extend the Renewable Portfolio Standard to require electric providers to purchase 50 percent of their power from clean energy sources, such as solar and wind, by 2030. • Enact the interim target for the Global Warming Solutions Act to reduce greenhouse gas emissions by 45 percent by 2030, as recently recommended by the Governor’s Council on Climate Change. • Remove the cap on shared solar and implement a program that will benefit residents who can’t currently put solar panels at their home or apartment, urban centers, and under-served residents, as well as create jobs and lower energy bills. • Continue supporting policies to make it easier for consumers to purchase, afford, and charge electric vehicles in Connecticut. • Fix last session’s one-sided ratepayer impact statement that ignores the benefits of renewable energy and efficiency proposals in new legislation. • Protect and build up programs that reduce emissions, save money for families, and generate jobs in the growing clean energy and energy efficiency industries. 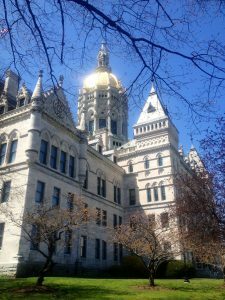 • Improve accountability and protect public health by strengthening Connecticut’s Sewage Right to Know Act to include electronic reporting and public notice of sewage releases. • Protect Clean Water Fund authorizations that help municipalities upgrade their infrastructure and keep sewage and excess nitrogen out of Long Island Sound. • Advance Long Island Sound Coastal Resiliency projects and advance policies that are under development to protect our coastline and shoreline communities. • Ensure the legislature passes a comprehensive State Water Plan. • Continue to defend the public drinking water supply by making sure Class I and II watershed lands remain protected. • Remain vigilant against attempts to weaken environmental protections that safeguard public health and our shared natural resources. • Work to fix detrimental environmental rollbacks—like the newly minted 90-day automatic approval process—that threatens public health and safety, wildlife, and the environment. If you want to be updated on our legislative work, sign up here.